I seem to have a knack for taking on enthusiasms for products that take forever to get to market. As longtime T.O.P. 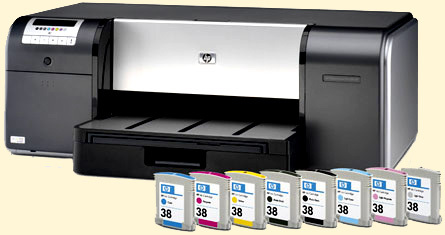 perusers know, I've been cheerleading the HP B9180 pigment inkjet printer since it was announced 18 years ago*. Well, it finally seems to be reaching actual vendors, and from there, coming to rest on the desktops of actual users. Three cheers! It's at least half a year late. Vincent Oliver, printer reviewer nonpareil, announced he was starting one of his very thorough interactive reviews, publishing the first page of it and a rather cursory video, way back in May...you remember May? Sprouting green things, daffodils, that sort of thing? ...After which, nothing. "Colours on the prints using HP Advanced photo media are without question outstanding, they easily surpass any prints from previous reviews. The Vivera inks are much more vivid than other pigment ink colours, I would go as far as to say they are as vibrant as dye inks and as a bonus they will last for 200 years (I have not tested this, but I will take Henry Wilhelm’s word for it). Monochrome printing is also excellent, the prints are neutral without any noticeable colour cast...I have tried to avoid using too many phrases like 'The Best Printer to date,' but to hell with it, it is the best printer I have used and HP should be given every credit for it." Any printer that Henry Wilhelm proclaims to produce prints with the best LE in the history of color photography deserves both our enthusiasm and our [provisional] support, but it's not a bad thing to hear that the prints look nice too. Now I get to submerge myself in the near-hopeless task of finding the right person at HP from whom to extract a test sample to review. Stay tuned. Well, yes, stay tuned, but at the same time don't hold your breath. This has not been proving a rapid process, up till now. * timescale adjusted for subjective impression. Featured Comment by thechrisproject: I've read a bunch of reviews about the B9180, but it wasn't until I saw a portfolio of its prints at CompUSA (only store in town carrying it) that I knew I had to have it. I wrote a brief review of it. It's a great printer, no doubt about it, I tested it briefly at Photokina and I was quite impressed. The only thing that's going against it - and this is generally true of HP printers - is that it's one HUGE b*stard. Seriously, my Canon i9950 (13x19) has almost exactly the same footprint as my HP8450 (8x10). And the B9180 (stroke of marketing genius, that name) is almost exactly twice the size of the abovementioned Canon.